Real ale apparently enjoyed a little gain in market share last year – the “the first increase for generations”, it says here. In 2008 it accounted for 5.8 per cent of draught beer sales in pubs; in 2009, 6.1 per cent. The same period saw a drop in lager’s share of the market – for the first time in 50-odd years – from 74.5 to 74.3 per cent. So well done, real ale brewers, eh? Well, maybe. I’m just a bit surprised it’s taken this long, really. We’ve been hearing for years now about what Camra has achieved: the most successful consumer group ever, wasn’t it? 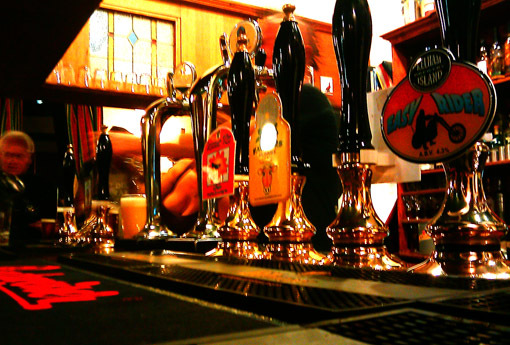 Let’s remember that pubs are struggling, and this means they’re selling less beer overall. In a falling market, a product achieves a greater market share if its sales simply stand still while others’ decline. My semi-educated guess is that part of this ‘achievement’ is accounted for by real ale drinkers being generally a bit better off financially than lager drinkers and thus more able to keep going to the pub during a recession. Real ale brewers could make real strides forward, though, by trying to rid their product of some of the cultural connotations that put people off it. Now, God bless middle-aged white blokes with beards, long hair, role-playing games and Red Dwarf T-shirts. God bless ’em. Some of my best friends are middle-aged white blokes with beards, long hair, role-playing games and Red Dwarf T-shirts. It’s just not an image that all consumers will want to buy into. And plenty more people would drink cask beer if more brewers took a leaf from the book of, say, those crazy young turks at BrewDog instead of choosing – with the names of their beers, the design of their pump clips and every other branding decision they make – to keep real ale in the Dungeons and Dragons ghetto. So, shall we get to the pub? First up, apologies are due to the Hadfield, probably the least worst pub around this bit of Sheffield to go and watch the football on TV. The previous edition of A Week in Pubs completely forgot that I was there on Sunday 5 September, giving moral support to Dan while he watched his Sheffield Wednesday team lose 1-0 at Brentford. Five quid for a burger and chips and a pint of bitter sounds a half decent deal, doesn’t it? The bitter was John Smiths, and the bloke behind the bar seemed a tad bitter at having to go and see if the kitchen had any veggieburgers. But it did the job. Unlike Sheffield Wednesday’s strikers. While I remain convinced that Sheffield is one of the best cities for pubs on God’s sweet Earth, the really outstanding pubs don’t do football on TV. Perhaps one of the reasons people go to, say, the Wellington or the Fat Cat is to avoid football on TV, and/or the crowd they associate with it. I bet somewhere like the Rutland Arms could achieve a happy medium though. What do you think, gentle reader? 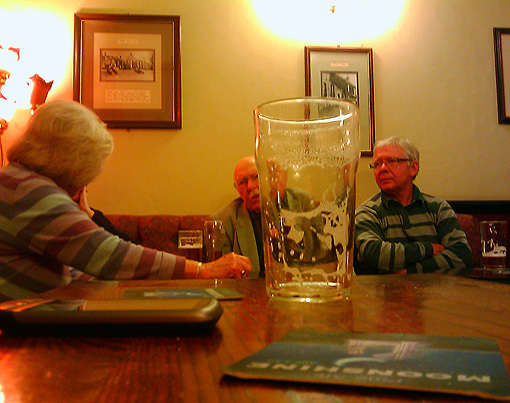 Get to the pub.com would benefit immensely from a pooling of expert opinion on Good Pubs to Watch the Football. The pubbing for this week proper begins on Wednesday with the rare treat of a trip over to Heeley to the Sheaf View, and then a nightcap back home at the Princess Royal. The Sheaf View is a marvellous place, where I once had a mystical pub experience of transcendent spiritual oneness and bliss (and wrote a song partly inspired by it). No, really – I’d only had a couple of pints. Tonight I get nearly as excited all over again, because they have Burton Porter from the Burton Bridge Brewery. My love for Burton Porter is like a long, fabled affair with an elusive lover, built on unforgettable snatched liaisons separated by decades and continents. Or the midlands, at any rate. I first drank this stuff in the early 1990s at the White Lion in Walsall, then didn’t see it anywhere until I went to the Sheaf View in 2004. This is the first time since then. My eyes are widening rapidly. I think my pulse is starting to quicken. And I may well be dribbling onto my T-shirt. Burton Porter is the richest, most complex and satisfying beer I’ve ever necked. It is, in fact, my Favourite Beer Ever. So is it ecstasy I feel as the black porter washes across my tastebuds and the first sweet fume of roasted malt rises inside? Actually, no. It’s a very nice pint indeed. But it doesn’t quite hit the spot like it used to. What a curious feeling it is to be supping a very nice pint indeed, yet feeling disappointment. Have they changed the recipe? Or am I just spoilt rotten with excellent cask ales these days? There’s no way of knowing: taste is so fleeting a sensation, filtered through time and subjectivity. And after one round, the barrel’s finished, and with it my plan – purely in the noble spirit of scientific enquiry and authoritative blogging – to drink four more pints before the night’s out. So it’s all over until 2018. Goodbye, my love. This week in pubs ends on Saturday at the Rising Sun over in Nether Green. There are fine beers from the Abbeydale brewery. There’s a wide spread of ages among the drinkers here. There are charming new people I’m meeting. There’s lovely décor. And there are Henderson’s Relish-flavoured crisps. You can’t ask for much more than that. Pubs and footy in Sheffield… yup, a tough one. I usually default to the Red Lion in the city centre. They’ve usually got one or two local beers on and it’s a friendly enough pub. Just hard to get a seat in front of the big screen usually. Other than that, like you, I’d welcome any other suggestions. Time was, you could go and watch football upstairs in the Fat Cat. I was often the sole watcher of Derby County matches (well unless you count the eponymous cat, who would sit and watch with me, as long as I petted). They couldn’t afford S*y when the prices went up, but I think the tellies are still there – perhaps if it were a BBC1/ITV1 number, you could still watch up there. Is the Rising Sun really in Fulwood? I’d say it’s in Nether Green (or Nethergreen if you prefer). I know it doesn’t really matter, but ‘Fulwood’ makes it sound further from my house, and I can do without that. I recently watched football at the newly-tenanted Bull’s Head in Ranmoor. The pub was bare, there was nobody there (to speak of), but they had Farmer’s Bitter from Bradfield, along with Timothy Taylor and his ubiquitous Landlord. I wasn’t boozing (early kick off and I had jobs to do later in the day) so I can’t vouch for the beers’ quality. I know that in the past people have been put off by the cufflinks-and-4×4 brigade in there. I am one of them. None in attendance at 1pm on a Saturday though. I think maybe I’d give it another go, particularly if it was televised football I was after. Hey! I could then walk the few seconds to the Rising Sun in, er, Nether Green. Steve, yeah, I agree on both points. But I haven’t really grasped the case against the BrewDog folks. I hear general grumbling about them but what’s the basis for it? Mark – the Broadfield is still good for the football actually. Doing much better than, say, 18 months or two years ago. It was rammed when we watched Spurs v Man City in there at the end of last season. Moopind! I’ve changed it to Nether Green. Dunno where I am round there, really. Thanks for that. the case against brewdog rests on their stupid stunt beers and their general studenty attitude. their sensible %age stuff (eg trashy blonde) is actually nice but still comes wrapped in this “ha, we’re going to show THE MAN how to make beer for we are Exciting Rebels Of Some Form” packaging that’s almost as [facepalm] as the innuendo-ridden old-style naming of beers. Yeah – the broadie. I’ve just been going there too long. I dunno – there’s something about it that just disappoints me every time I go in. I put it down to a serious lack of competition in the area. I think they’re just a bit complacent. Still, in its favour, it does have Best Kebab Shop In The World* across the road from it, which was still pretty good last time I stopped off there after a night of Too Much Beer.